1. Back in January of 2011, I wrote a post that described a neat cascade of impacts that started with a prescribed fire we conducted. The fire influenced cattle grazing, which altered feeding habits of mice, which allowed prairie clover plants to make seed, which dropped to the ground in a place where they had a pretty good chance to germinate and grow. It was an example of the kind of complex interactions that make nature so fun and interesting. Well, Kevin G. Smith, associate director of the Tyson Research Center in Missouri conducted a study that shows a similar series of complex interactions. In his case, however, he didn’t just stumble across it – he set up a research study to test it experimentally. In a wonderfully simple design, he demonstrated that the flowering density of purple loosestrife can influence the abundance of zooplankton in wetlands. You can read a description of the study here, which includes a wonderful chain of influences that includes purple loosestrife, pollinators, dragonflies (and their larvae), and zooplankton. Although purple loosestrife is an invasive plant in wetlands, its invasive nature was not the point of the project (though there are potentially interesting ramifications there). Instead, the project was simply a great example of the interconnectivity of species and natural processes. In Smith’s research project, dragonflies favored wetlands with more purple loosestrife because there were more pollinators to feed on. The dragonflies also laid more eggs in those wetlands, and the larvae then impacted zooplankton populations. 2. Last summer I posted a photo of dodder in one of our prairies, and wrote a short description of this intriguing species. Dodder is a parasitic plant that looks like orange plastic twine someone carelessly threw out in the prairie. Because it leeches nutrients from the hapless plant(s) it attaches to, it doesn’t need its own chlorophyll. Robert Krulwich had a great blog post on NPR.org about a month ago that described how dodder uses its “sense of smell” to find the plant species it wants to attach to. He included a fantastic short video that shows a dodder plant “nosing” around until it picks up the scent of its target plant and then grows quickly toward it. Krulwich also summarized a research project that tested to be sure it was scent that drew the dodder to its “prey”. Great stuff. I hope you enjoy these stories as much as I enjoyed not having to write them! 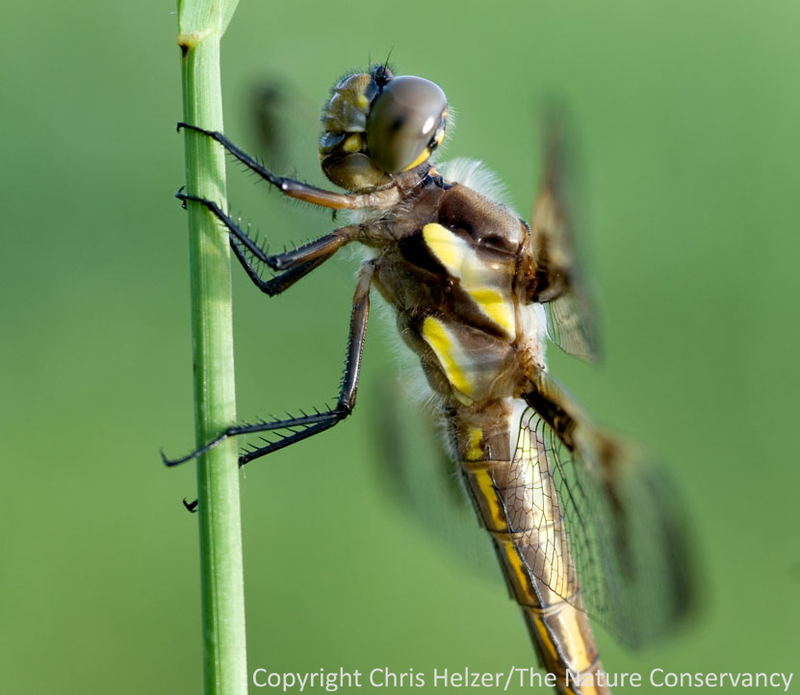 This entry was posted in General, Prairie Animals, Prairie Insects, Prairie Natural History, Prairie Photography, Prairie Plants and tagged dodder, dragonflies, prairie, purple loosestrife, research, wetlands by Chris Helzer. Bookmark the permalink. So this can demonstrate the complete effect of pollution or chemical fertilizers. Great picture & article, with past links. Plants smelling plants,and the study with the dragonflies, makes me wonder what they are eating when they come to my yard. I assumed maybe mosquitos, but much more is going on. No scientist here, but enjoy your blog. Kevin’s (et al.’s) work on community assembly, etc. of ponds is full of elegant experiments elucidating the influence of one species on the occurrence of others, basically, putting much more nuance to the old keystone species concept.